"99 Ways of A Back Slider"
Welcome to "99 Ways of A Back Slider"
People think that just because we slip up from time to time is back-sliding but it isn’t. God created us, yes, but He knew we wasn’t going to be perfect; if we were none of us would need Jesus. Back-sliding however, is more serious than making a mistake. 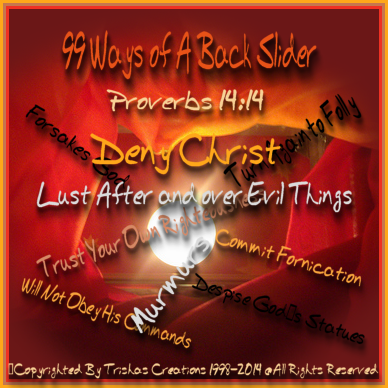 I have listed from the Bible examples of “Backsliding” and the scriptures to show and prove it. In Christianity, within denominations which teach Armenians, such as the Methodist Church and Pentecostal Holiness Church, as well as in the Roman Catholic Church, backsliding is a state in which any free willed believer can adopt, which is a doctrine rejected by most Calvinists. In these denominations, it is taught that the backslidden individual is in danger of Hell if he does not repent . Historically, backsliding was considered a trait of the Biblical Israel which would turn from the Abrahamic God to follow idols. In the New Testament church , the story of the Prodigal Son has become a representation of a backslider. All of these are an indicator of the backslider, whether it be a man or woman, when they once walked in the Path of the Lord God, and now has left Him. Left Him out of their lives. A Man and Woman in which has been through the devil and retreated from many battles. But the Backslider joined the enemy, and man or woman who once belonged to God, but is now removed, who has been overcome by the sin and satan and filled with his ways. You cannot get to heaven by being a backslider. Anyone can believe in Jesus Christ, but if you are still committing and turning your back from Him, you are a Backslider, no if’s ands or buts about it.